Do you wish your teeth had more shine or a more uniform shape? Are their gaps in your smile? If you've answered "yes" to any of the above, give Westfort Family Dental a call! With our teeth whitening in Thunder Bay, we can banish the stains caused by tobacco or acidic foods and beverages that have dulled the brightness of your teeth and made you feel self-conscious about their appearance. We offer both in-office and take home bleaching options for greater convenience. The in-office treatment lasts about an hour and uses a more concentrated whitening agent that's not available outside of a dental office. For people who have more sensitive teeth or time restrictions, we recommend the take home method as it can whiten your teeth gradually in the comfort of your own home. Whether you want to whiten your teeth a little or a lot, we have a treatment plan for you! Veneers are thin, semi-transparent shells made of porcelain that are placed on the surface of your teeth. A very thin layer of enamel will first be removed from your tooth so the veneer can be permanently bonded to it. Veneers are ideal for improving the colour, length, size, shape, and alignment of your teeth. The porcelain material looks natural and will effectively conceal stained or misshaped teeth. A veneer can be placed on a single tooth or several teeth. Everyone deserves to be proud of their smile. Westfort Family Dental takes tremendous pride in helping patients improve the look of their smile and watching their confidence grow! Give our office a call today to schedule a consultation. 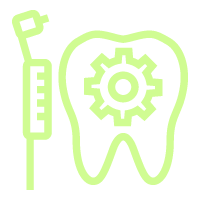 Our cosmetic dentistry services are performed by a trained and experienced general dentist.